Meet John Vanderlaan ~ See Why I will keep featuring bloggers! →Meet John Vanderlaan ~ See Why I will keep featuring bloggers! I took a break but I’ back! Every Thursday, I talk about someone here (I mean on this blog). For the past couple of weeks, I went on a short break. But my Thursday series will never completely die out. The simple reason is that there are lots of awesome bloggers out there and I’ll keep talking to you about them. These are not just people picked under a bridge. They are wonderful boys and girls you should connect with. My excitement is the fact that they are my friends. I know you can gain something hanging out with them. But why am I running this series on my blog? Blogging is awesome and I keep meeting new people everyday. That’s the success point of the activity. The more savvy bloggers you connect with, the more your chances to grow your business. So I want you to also meet these leaders so together we can build a thriving community of successful bloggers. The second reason I do this is to promote my friends. I know by featuring them on my blog, I strengthen our relationship, give them more exposure and a chance to acquire more clients. If there is anything I can do to help you get to the top of the ladder, I will do it even at midnight and my wife won’t complain. In the past, I have featured tens of extra-ordinary bloggers. Check them out here. Let’s meet the guy of this week. 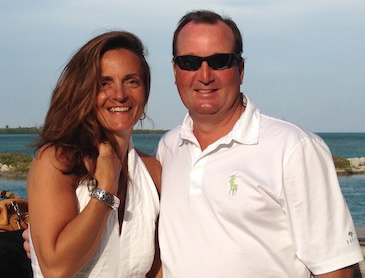 John lives in Connecticut USA with his beautiful wife Maria and 3 children. He enjoys traveling with his family and spends part of the summer in Cape Cod and part of the winter in the fabulous Florida Keys. He also enjoys playing golf with his two sons, both of which are highly ranked amateurs playing collegiate golf at Florida Southern College. At 50 years old, John has the distinction of never having worked for anyone but himself and has been very successful in a number of businesses, both online and offline. Just out of high school, he started his own Mobile catering business, following in his father’s footsteps. He would eventually take over his father’s business and go on to grow that into a multi million dollar company. He then had an opportunity to purchase a very small bottled water business and he knew that this industry was poised for growth. After buying the bottled water business, he focused on growing that business and was able to double sales every year. It was during this time that his first son was born and the toll of running two businesses was beginning to show. He remembers leaving his house every day at 4am and returning each night, sometimes as late as 10pm, not seeing his son for days at a time. He arrived home late one night and went into his son’s nursery and just stood there looking at him asleep in his crib. It was that night that he realized that something needed to change, or he was not going to see his little boy grow up. He put a plan into action to extract himself from both businesses and used some of the money to invest in real estate. He was very successful in this venture, but he still wanted more time with his family. In 2007 John started his first website with SBI. It was a big learning curve, but he was motivated to make it work. He taught himself html and rapidly progressed to build a second niche site around another one of his passions. He made a typical beginner mistake and did not have a good plan for monetization of these sites. He settled on Google Adsense and quickly began making $100 – $200 per month. It wasn’t bad, but not exactly what he was trying to do. John learned from his mistake and began to learn everything that he could about affiliate marketing. He started building niche sites and making money with the Amazon affiliate program. After building a number of successful niche sites, he decided that he wanted to help others learn to do what he was successful at. He knew that to be successful in the “make money online” niche he was going to have to identify a problem that his prospective readers face and offer them a solution. As someone that had spent years in this niche, the biggest problem that he faced was avoiding all of the scams online. When he began online, it seemed like there was another scam artist around every corner. So he decided that he would focus on helping beginners to find legitimate ways to make money online and avoid spending their hard earned money on scams and the “next shiny object”. John has been very successful and now has a loyal following of students that he has helped. His top recommendation for his readers interested in making money online is Wealthy Affiliate and he prides himself on the fact that he has not had one unsatisfied student. John has a passion for making money online and sharing his knowledge with others. He loves working from home and can’t wait to get up in the morning to start another profitable day! He also loves to get social! Drop him a comment. He will be here to respond. Share this post on social media. Let’s show him some luv. Yes it is not doubt if you are living in the company of great people like john vanderlaan and especially you enstine there we must gain different unique content different ideas special wording awesome writing style. Thanks to provide us a chance to meet vanderlaan. Thanks for a wonderful series where you show us great bloggers and online marketers making a difference. You ma namesake; yo know that? And i’m happy to see here with Enstine – You are welcome. Your Story is quite interesting, and i learned a lot from it too. John, this is astuteness. An entrepreneur with the gift of empathy. I admire how you quickly got a business idea by just looking at little John in his crib sleeping. No cracking of the brain. Whatever. Yet, it still worked. You’re successful online because you chose not to give up. I’ve been thinking of giving up lately. But I don’t think I’ll anymore. Why? If you’re still online at age 50, why should I. You’ve added more grease to my elbow, John. The one thing that all successful entrepreneurs have in common is that they refuse to give up! If what you are currently doing isn’t working, then change what your doing, but never give up! That’s helpful and most beneficial knowledge for me. Really, I like this story. I am a New on this field, but today I am very happy to working in this field. Thanks John for shared personal knowledge on this blog. If you are new to blogging, you are in the right place! Follow Enstine and watch what he does very closely. You will learn more than you could evr learn in any book! Thanks for the comment Asif! wow, great story to read and he is such an inspiration to the youth by the way. have a successful offline career his determination to do something online as well is worth mentioning. Great work John, looking up to you! Thanks for the kind words and the awesome comment! You really can do anything that you set your mind to, but most people are not willing to do the work necessary to succeed. I am very thankful that Enstine featured me here! Great to meet John here and read his story. I love success stories like this that are credible, because they acknowledge that there has been hard work along the way. I think once an entrepreneur always an entrepreneur. I have been self-employed almost all my life with just one or two returns to employment when “needs must” but I found it very difficult and couldn’t wait to get out again and “be my own boss”. All power to John (and the rest of us)! It was a pleasure to meet you over on my blog and awesome of you to comment here! I agree with you. I can’t even imagine working for someone else. I am filled with the excitement of creating revenue and building, long term sustainable businesses. Thanks again for connecting Joy! John is awesome. He tirelessly works to promote other bloggers – as you do – and he is so darn positive. I wonder where he gets that energy from. He also carved out a neat niche for himself because all newbies and even vets online want to avoid the scams, the silliness and the riffraff which manifests itself as online scams. Gotta have a seasoned vet to show you the way and John has been there. I enjoyed tons reading his entire story. Great to see you hear my friend! The energy comes from doing what you love. I truly can’t wait to get up in the morning and get to work! It is awesome to help people and also pretty cool to connect with people like you an Enstine. I know that you are currently in Cypress, Blogging from Paradise, and I am jealous! I look forward to working together any way we can! Very nice article.you are very successful in every field .nice to give time to your family they needs you.Thanks a lot.I will bookmark your site. Thanks for the comment and your kind words! I have worked hard to find a balance in my life where hard work allows me time with my family. It is not easy, but well worth the effort! I really enjoyed reading about your success story. Just more proof that determination, hard work and a goal will cause success. Nice to meet you and thank you, Enstine for introducing John. It is nice to meet you and thank you for visiting and saying hello over at my facebook page! I think you have the exact recipe for success! a nice and inspiring Story . if the parent can be with them and can spend more time with the Family.Good if many can be their own boss. You are right that it is the future and time with family is precious! I just love John’s story because I walked a similar path. I had my own businesses since I ever could remember. I only worked a few years on Wall St. NYC to learn that it wasn’t me. I was born an entrepreneur and did something about it. I liked that he was in real estate…I was too for a while and it was a blast. I still have 2 properties left because I feel sorry for the single moms living there. When their kids get a little older I’ll flip the houses. Yes..I ONLY rent to single moms and those who are on “Section 8” which is a system where their rent is compensated by the government here. John even lives nearby me…very close proximity. I am further north but the beaches are why I moved here lol. John has motivation and that is the most important thing in business. That “fire in your belly” that makes you do what you have to do. If you don’t have that….better off getting a job. Thanks for introducing us to a wonderful man. Thank you for the awesome comment! It is true that I have that “fire in your belly”. I think that all true entrepreneurs have it. It’s such a motivational post. There is always good to know about the people who have achieved their goals in the life. John seems have the big hand in many both offline and online businesses. He would have worked so hard for this. You are right! I have worked very hard in my life and learned many lessons along the way. Here I am at 50 years old and I am still learning everyday!